The standard room is well appointed, free Austar & internet, air cond, tea & coffee facilities. Flat screen HD TV. Queen bed & renovated bathroom. Fully stocked mini bar and plenty of room to spread out & relax or work comfortably. Opposite club. A spacious and well appointed room, includes free tea / coffee making facilities. Smoking room available on request. We are well located for access to the CBD. A spacious and renovated suite. Will be either a Queen or Twin Room (as per availability), includes iron, ironing board, reverse cycle air conditioning, electric blanket, colour television, free Austar and broadband. A spacious & well appointed room, includes free tea / coffee making facilities. An additional $5 charge applies for guests using separate beds. We are well located for access to the CBD. Provided as either a Deluxe Queen or Executive Room depending on availability, plus a hot or continental breakfast included in the tariff. Rate is for 1 person. All that the discerning business or recreational traveller could ask for; a very spacious & well appointed room, includes free tea / coffee making facilities. We are well located for access to the CBD. Price is for 2 people only. A spacious and renovated suite. Includes free tea / coffee making facilities, iron, ironing board, reverse cycle air conditioning, electric blanket, colour television, free Austar and broadband. A great room for the travelling family. The charm of yesteryear, with all the facilities of today. 2 bedrooms, big kitchen, bath/laundry, big screen TV, DVD player. Can be arranged with cleaning services to meet your needs. A stroll to the CBD, close to sporting fields and parks. Simply great. Provided as either a Deluxe Queen or Executive Room depending on availability. Tariff includes 2 course dinner, 1 drink, plus a hot or continental breakfast included in the tariff. Rate is for 1 person. Fully renovated in 2011, super comfortable king bed, split system air conditioning, DVD player, FREE WIFI, FREE Foxtel. Whisper quiet and away from the hustle and bustle. Rhonda & Ross Thomson, owners and hosts, and the friendly team welcome you to Inverell, the ‘Sapphire City’. 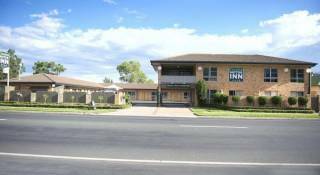 Whether you are travelling to Inverell for business or pleasure you can be assured of a great welcome, a great time, and warm, friendly country service at the Sapphire City Motor Inn. In addition to the great services offered at the motel all online bookings are eligible for a 10% discount on meals if requested. And did we mention the terrific friendly country service that we provide? You truly need to experience it; we know that you will come back time and time again. We offer a terrific range of accommodation choices for your convenience – single rooms, doubles, twin rooms, triples, and a range of family rooms. All our rooms are ground floor and we have two ‘easy access’ rooms. For guests wanting to know the total cost of their visit in advance why not have a look at our bed & breakfast, or even our dinner, bed & breakfast packages. In addition to our traditional motel rooms we now also offer a fully self contained cottage for people seeking this type of accommodation. The cottage is a circa 1930's workers cottage and is located immediately to the rear of the motel. You can enjoy a touch of yesteryear, with all the modern conveniences that is expected today. The cottage offers 2 bedrooms, each with a queen and king single bed; plus a sleep out. The cottage offers the complete package – big TV with HD signal provided, DVD player, Austar (+20 channels), ducted heating and cooling, front verandah & undercover patio, huge renovated kitchen, almost new bathroom and a washing machine. Ample onsite parking is available at the Sapphire City Motor Inn with partial undercover parking available for most rooms. We can cater for vans, trailers, trucks and buses on-site. There is side street parking for larger vehicles adjacent to the motel. We offer the option of a full or continental breakfast, as well as dinners to your room seven days per week. Alternatively for dinner we have a charge back arrangement with local restaurants and some will even deliver to your door! There is even a park across the road so you can rest, relax, and let the kids run free or kick a ball. We are also immediately opposite the East Inverell Bowling Club, the club offers cost conscious dining; great cold drinks and we are told that their poker machines are pretty generous. Situated on Glen Innes Rd (for guests using GPS devices use 3 Greaves St) we are an easy stroll to the Inverell shopping centre, local churches, and most sporting facilities. We also provide easy access to Maclean Village, making us an ideal place to stay when visiting family or friends at Maclean. Sapphire City Motor Inn is also ideally located to provide access to local attractions, such as; fossicking, Inverell Motor Museum, Heritage Village, wineries, Copeton Waters (one of Australia’s largest water storage facilities, offering a full range of water sports, fishing and bush walking) to name just a few. Inverell is also a great base for day trips to the New England highlands, the cotton fields of Narrabri, or the spa pools at Moree. Reception hours are 8:00 am to 9:00 pm Monday to Friday, 8:00 am to 8:00 pm on weekends and public holidays however we live on-site and provide 24 hour access via a night bell. If you are planning to arrive late please give us a call so we can make sure that the little things are taken care of for you – a light turned on in your room to welcome you, fresh milk in the fridge, the air conditioner or heater turned on, a dinner that can be reheated, and so on. Days spent travelling and arriving tired? Let us make your evening a comfortable and memorable one. You will be surprised at what Inverell has to offer both the business and recreational traveler. Stay a while and have a look around, we are sure you will be back. We will charge your card with the cost of your first night's accommodation, with any balance charged on the day of your departure. We require 48 hours notice of a cancellation. If your room is rebooked we will only charge a 10% cancellation fee. If your room is not rebooked we will charge you 50% of the room rate for the period of your stay. Inverell is known as 'The Gem of the Tablelands.' Situated in a rich grazing and cropping area, it has many attractions for the tourist. Arts, crafts, antiques and woodturning can be found at the Inverell Art Gallery, Kottage Kiya Gallery, New England Woodturning and Sapphire Tea Gardens to name a few. There are many fossicking areas with a variety of gems and minerals to be found including sapphires, zircon, quartz, grass stone, topaz, diamonds, tourmaline and tin. Visit the Dejon Sapphire Centre, Gem Centre and Tourist Information Centre to see and selection of items made from local stones. The Inverell Transport Museum has over 200 restored vehicles reflecting the history of transport. This is a must for motoring enthusiasts. The beautifully recreated Pioneer Village with local buildings, houses many different displays. It is a delightful walk down memory lane. A number of locations are interesting for bushwalking, picnic areas, bird watching and seeing a variety of plants and reptiles. Inverell district offers excellent fishing in the dams and river systems, particularly Copeton and Pindari Dams.